I have moved from Singapore to Sweden for almost a year now. And Hansel has just started preschool early this month. He is going to have teachers and friends who will speak Swedish to him, so I am not worried about him being able to pick up the language. 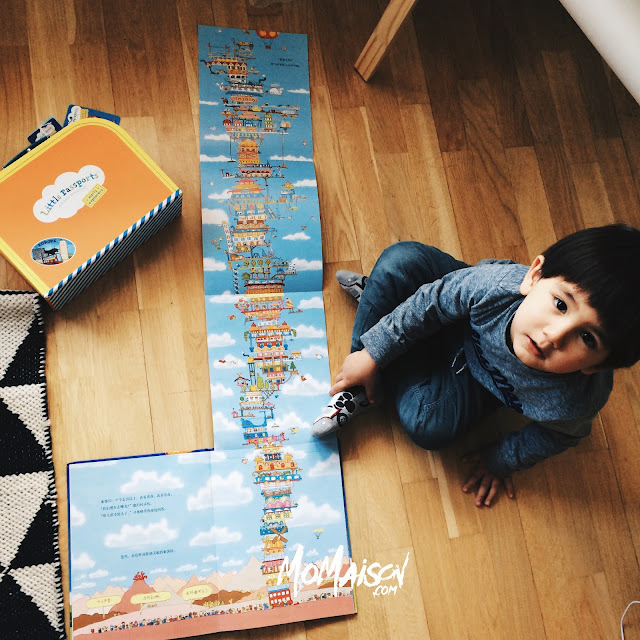 Children his age — 2.5 yo — pick up new languages very quickly and easily. Daniel is from the UK, he only knows how to speak English and basic Swedish (he picked it up when his mom spoke Swedish to him till he was 6) so naturally, from the time Hansel was born in Singapore, he has been speaking only English to him. I am from a bilingual family, speaking Mandarin more frequently than English, but most of my family members whom my little family were living together with and I somehow habitually spoke the latter more to Hansel. I have also gotten too used to speaking English to him that it's so difficult for me to change to communicating in Mandarin. I will always end up switching back to English because he doesn't understand and I'll have to translate what I said in Mandarin to English. 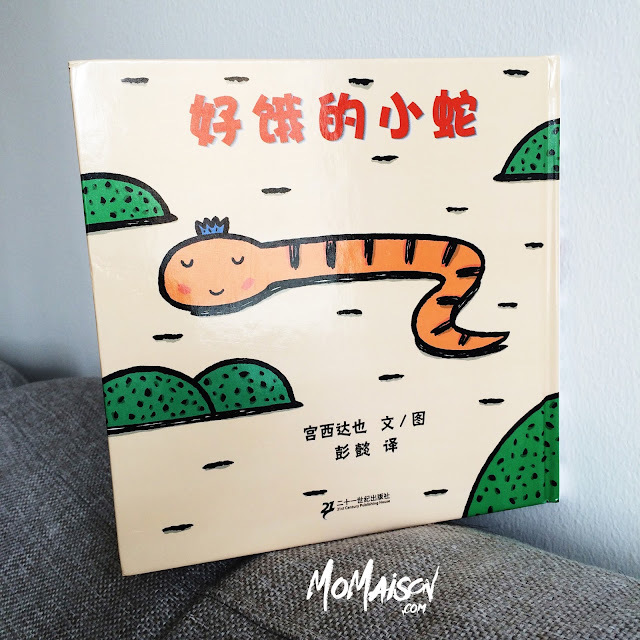 Thank god for Once upon a Bookstore that I can easily teach Hansel more Mandarin through fun and interactive books they have selectively picked out for toddlers & the young at heart (like me hahaha). I have recently received a few books from their collection and all of them WOWed Daniel and I. 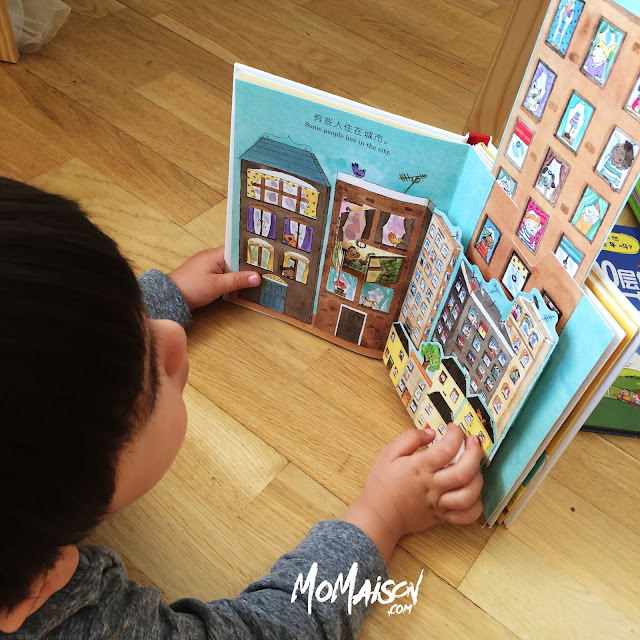 Yes, Daniel was also amazed by the adorable books with simple & easy to read texts! Let me show you a few that even I love taking out to read..
A slice of 匹萨， anyone? The battle of the beetles! PEEK-A-BOO 美丽的向日葵！ Anybody need a dose of happiness? Om nom nom, hungry 猴子 eating his favourite fruit! Hold your breath people, 清洁车 is here! 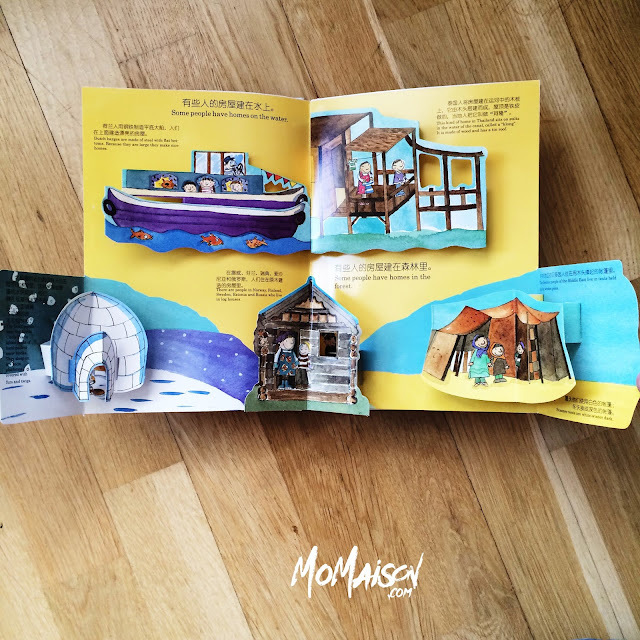 "This set of 6 interactive and colourful mini pop-up books by Japanese author Warabe Kimika, is filled with surprises. Have fun with the pop-ups, flaps and pull-out tabs as you introduce your little ones to various topics ranging from little bugs to vehicles to animals! They are also great for stashing into the diaper bag to keep your little ones entertained on the go. 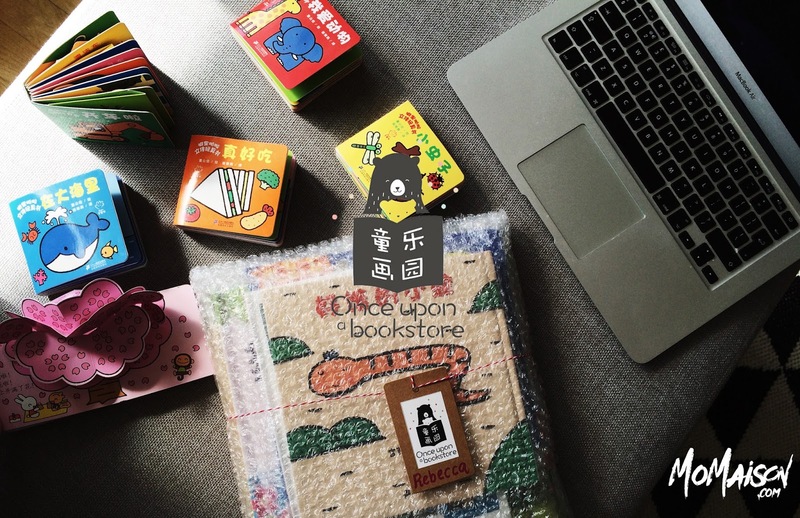 The books come nicely packed in a box, which makes this a popular gift option." Aren't they super cute??? Daniel said it's the best pop-up books he's ever seen. The 6 titles in the set are 真好吃，在大海里，小虫子，我爱动物，花和树 & 开车啦. All 6 books have 8 pages. 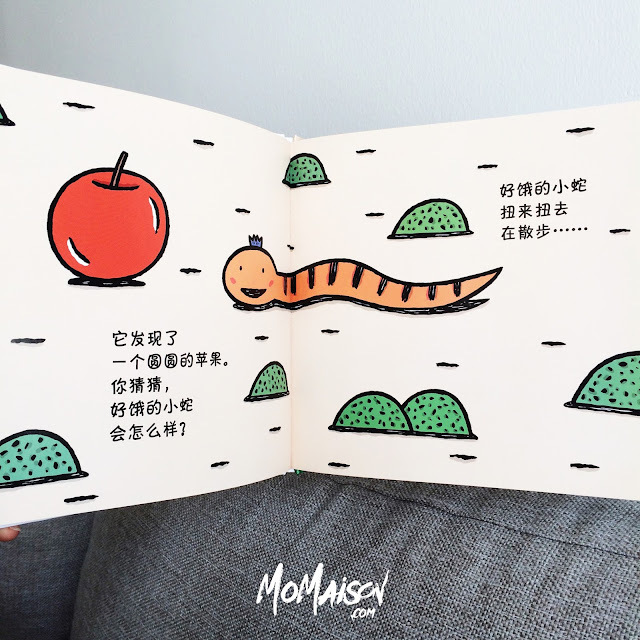 Translated from a book by famous Japanese author Miyanishi Tatsuya (宫西达也), this is a story about a hungry snake gobbling up whatever he sees along the way and the body would take the shape of what he ate. I picked this book as it can also be an imaginative game with your little one, by asking them what else could it have eaten that would cause the shape forming on it's body. Simple and adorable illustrations! 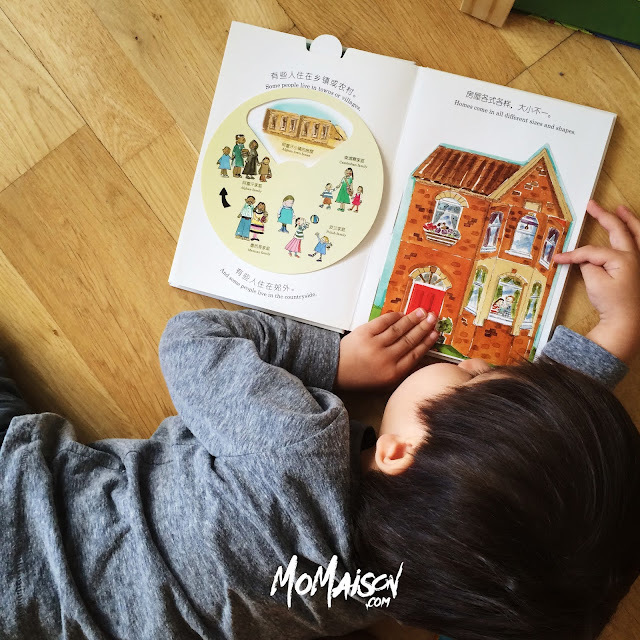 "This is a bilingual interactive non-fiction book which explores the different types of homes and dwellings that people all over the world live in, where people live in (in cities, on water etc) and what their houses are made of. 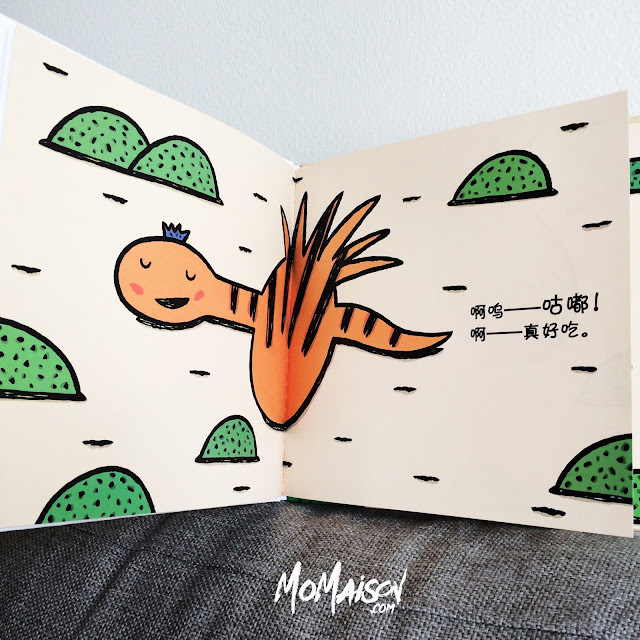 Kids will love the pop-ups, the flaps and the illustrations in the book, which will encourage engagement and interaction. 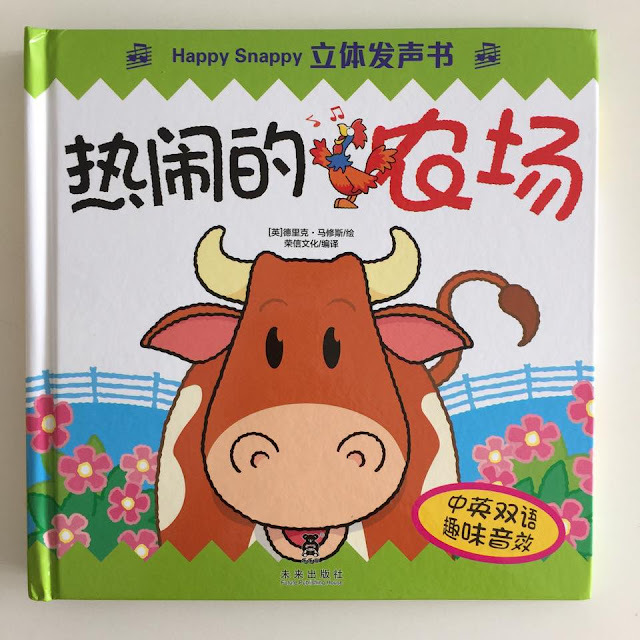 The book presents opportunities for discussions about geography, culture and traditions and an understanding that “无论住的是哪种房屋，无论在哪里，只有自己的家最好!" There is a craft activity right at the end of the book where your little one can make his/her own 3D river house and an apartment building." This is another book that is absolutely beautiful, I love the illustrations. All the books are just so amazing. It's like there is no favorite because they're all my favorites haha! 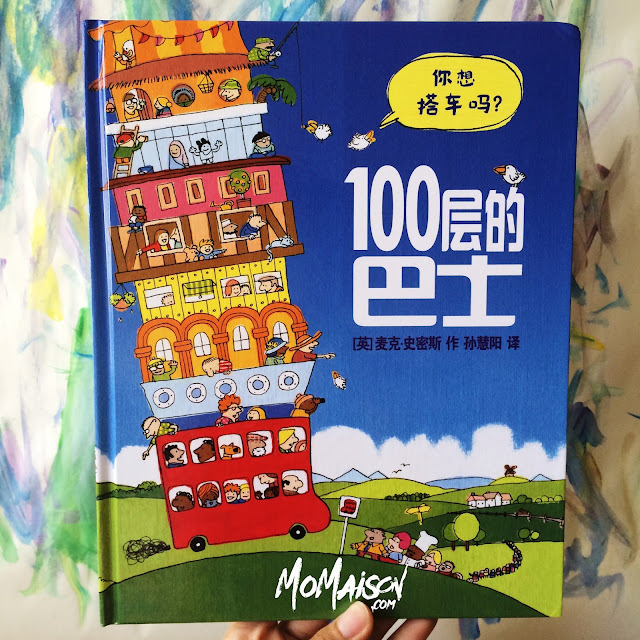 "This book is about a whimsical and fascinating story about a double decker bus that veers off its usual route and ended up picking up a bus full of happy passengers with no idea where they are going. Join these passengers on a little adventure as the bus drives on through various towns, villages and countries, picking up more passengers and decks along the way. Have fun exploring the colourful illustrations on each page with your little ones. With the level of detail, there will be something new to spot each time you read the book. The best part of the book (at least to me) is the 3 page fold out of the bus! All 100 decks of it! Go on and count the number of decks with your little ones." A very interesting book and as usual, with lovely illustrations. You could probably tell how well curated Once upon a Bookstore's collection is just from this post. The shop owner really has a sharp eye for attention-grabbing kids books. You gotta have that element to get your child interested in reading the book right? This was included in what I have received but, it is no longer for sale on Once upon a Bookstore. I just put it up to reemphasize on the shop owner's fine eye for detail. Another incredible book. Reading books have never been so interactive and fun! These books are great to help your child(ren) develop an interest in reading. It is very important to start cultivating that interest at a young age. Set a time every day/night when you will sit down with your child to read a couple of books. Make it a routine and habit, that you and your kid would feel uncomfortable not doing it. It could be a very special bonding time as well. 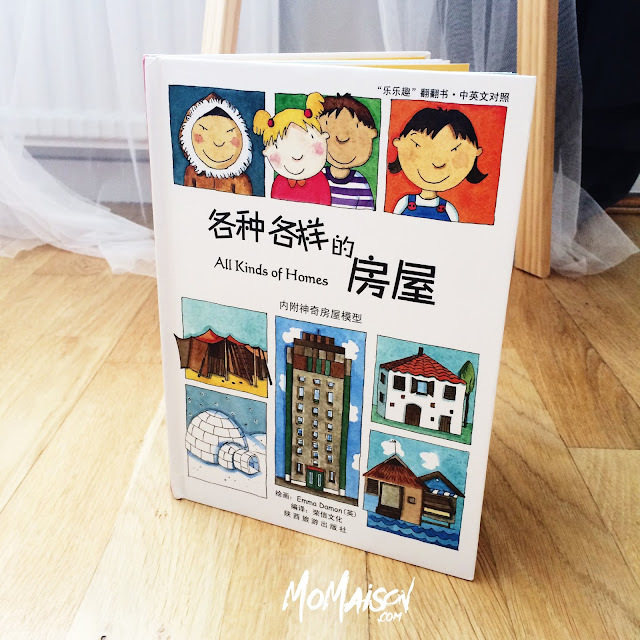 I have also learnt a few new Mandarin words myself from the books! If you would like to see more of their collection or stay updated with their new additions, you can visit their website here, like Once upon a Bookstore FB page, and follow their Instagram account. Support local business! Disclosure: I was provided with 5 books from Once upon a Bookstore for the purposes of this review.